Sharpak Bridgewater produce high-tech food packaging and specialise in the advanced packaging production for meat and the strict quality requirements of this industry. Originally the site production line was served by four 100kw Bluebox chillers which after many years of service had become unreliable and required frequent repairs to maintain robust chilled water production. Following the installation in 2014 of a 1MW Turbomiser™ chiller elsewhere on the site, Sharpak once again turned to Cooltherm to see if they could offer a highly efficient solution. THE CHALLENGE: to replace 400kW of connected chillers with 660kW worth of chillers to the same infrastructure. From an electrical view point the new Turbomiser chillers consume less power than the original machines and produce 260kW more cooling. Cooltherm utilised the exceptional properties of ABS pipework for the pipework modifications keeping any chilled water system production losses to a minimum and eliminating any corrosion risk. For the project to be a success, the Cooltherm team had to complete all the work with zero chilled water down time to production as cooling was critical. The ability to fabricate on site meant that throughout the whole project Cooltherm ensured Sharpak had 100% capacity at all times. The two new Turbomiser™ chillers have been optimised to share the cooling load at the most economical point of operation in all ambient and load conditions. With the current load profile experienced by the equipment the EER on the plant hasn’t dropped below 8:1 (across a range of ambient conditions), and EER figures have peaked as high as 12.5:1 in low ambient conditions. This is lower than the consumption of the sites original free-cooling arrangement (removed five years ago) because the compressor power plus low speed fans is less than a bank of fans on a dry-air cooler running at the higher speed needed to do the required level of free cooling. The chillers also feature Geoclima’s new Flex control system that runs the same software as the OnBoard controls, but features control board hardware isolation between all key components. 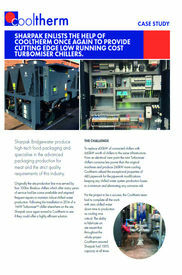 This eliminates a common controls fault being able to take a chiller offline. Also fitted to this machine is an addition to the remote monitoring system (in its 15th year), which is a self-learning algorithm which constantly monitors and learns how the chiller is operating, and it can be used to predict potential faults and maintenance requirements. i.e. condenser coil debris build up, or potential refrigerant leaks. This feature is being evaluated on this project in its beta development phase, and if a success will be rolled out as a standard option.